This document is intended to help Pega customers who use the new Pega File Manager that will replace the Pega File Transfer Appliance, effective January 31, 2017. As a Pega customer, you will typically use Pega File Manager to send and receive large files related to your Support Requests (SRs) with strong security protection. If you see references to Cerberus in the user interface or in the example screens shown in this document, do not be confused. Cerberus is the brand name of the FTP server that we use to host the Pega File Manager. Most Pega File Manager features and user interface controls are intuitive; therefore, not every feature is described in this document. Your notification looks like this example. Check whether the file can be attached directly to the SR through My Support Portal. This is the preferred method for attaching files. If the file is large, compress it as a .zip file or 7z archive before attaching. If the file is still too large to attach to the SR even after compression, contact the Pega customer support engineer working on your case. The GCS engineer will provide a link to a folder where you can upload the file and a password to access the folder. Click the folder link provided and enter the password. After you have opened the folder, click Add Files and select your file. A progress bar will appear to show the status of the upload. To preview an uploaded file, click Preview. 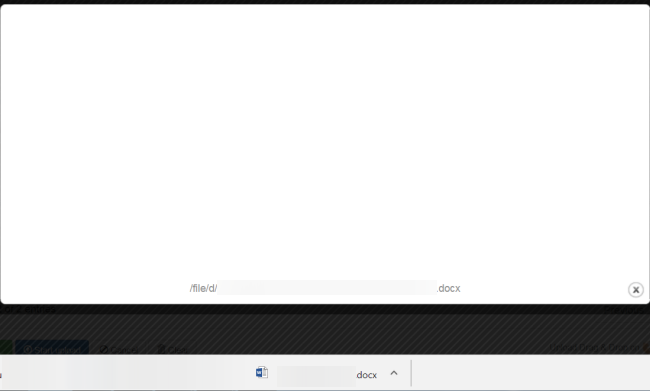 File Manager displays a white screen (Preview window) with the file link at the bottom, similar to a file download. To download a selected file, click Download. File Manager Download works like any browser download. My original plan was to post a PDF of this procedure document to the Product Support page, the Resources list. The PDF file is attached here. My high-priority PDN Request to add the PDF link to the Product Support page is pending. Maybe that's a silly question but where can I find this application? Is is available via webpage or should it be downloaded? That's correct, Pawel: You need to wait to get a file or folder on the FTP site from the GCS customer support engineer who is handling your SR. Thanks for your good questions and your patience as we all learn this new tool together. Can you please clarify whether or not users need to request an account or not? If users should not be requesting accounts, then should this option to request one not be disabled? Please see the responses to your same question in the GCS internal community discussion regarding the new file-sharing tool, https://mesh.pega.com/docs/DOC-117873#comment-81159. As I recommended in that Pega-internal discussion, GCS and other Pega personnel should submit a Pega IT REQ to report bugs, issues, and questions for themselves and on behalf of our customers regarding the new Pega File Manager. Log in with your Pega credentials (user name and password).